Whether you’re in the planning stages of designing a new home or looking for small ways to upgrade your existing one, installing a central vacuum system should be on the top of your wish list! Depending on how regularly and thorough your cleaning routine might be (do you have two bedrooms or five? asthma and allergy sufferers who require clean environments?) a central vacuum can actually make a lot of sense for your home. So what exactly IS a central vacuum? It’s a vacuum system that can be installed in either a basement or garage, with the main power unit linked to inlets in each room. These inlets are installed in walls throughout your home — kind of like a regular power outlet, except it’s for your vacuum. You then attach the vacuum hose into your chosen inlet, and it’s the only thing you’ll need to carry from room to room. How handy is that?! Low maintenance. The storage on many central vacuums is huge. Like 10+ gallons huge. That means that even with regular usage, you’re looking at having to empty the tank only 2-3 times a year. Less to lug around. If your home has multiple levels, the weight and size of your vacuum is probably going to matter to you. Because let’s face it: the more cumbersome it is to transport throughout the house, the less likely you are to actually use it…which defeats the entire purpose of having a high-quality vacuum. With a central vacuum, all you’re carrying is a lightweight hose. They’re super-powerful. 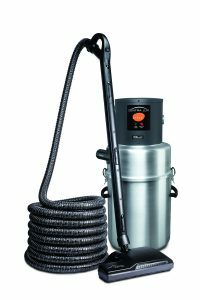 Your average central vacuum unit is going to offer about twice the amount of suction of your traditional portable vacuum cleaner. And that means more dirt and unwanted debris is removed from your surfaces. Your indoor air quality will improve. A central vacuum with a washable filter can trap 99.97% of contaminants as small as 0.3 microns, performing at levels equal to HEPA standards. This is great news for anyone who has asthma or allergy sufferers in their home! The yucky stuff stays far, far away. Since the tank is installed in a garage, basement or utility room, everything sucked out of your carpets, upholstery and flooring is whisked away – away from you, your family, and your (new!) clean air. Say goodbye to emptying a tiny bag or canister after every use, only to have dust and debris go flying everywhere. 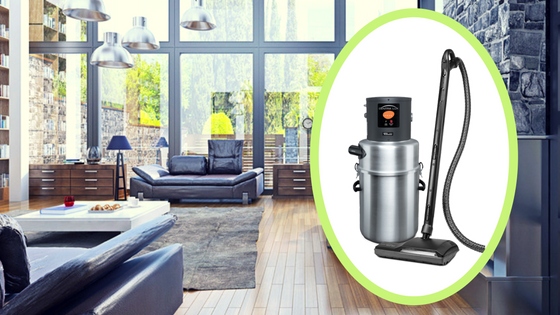 With a central vacuum, it’s out-of-sight, out-of-mind! It’s seriously quiet. Again, because the unit’s motor is hidden in a basement or garage, there’s little more than a whisper when you insert the power hose into one of the inlets. At long last, the beef your pets have always had with those super-scary traditional vacuum cleaners can come to a satisfying conclusion! Convenient accessories make it a multi-tasker. Yes – just like on your vacuum! Mini nozzles for small spaces, crevice tools, upholstery tools – they can all connect to the main hose for your central vacuum, which means there’s almost nothing it can’t clean! Our favorite central vacuum? The Aerus CentraLux, of course! This powerhouse unit will make vacuuming a snap – in fact, it might even make you look forward to vacuuming. Imagine that! 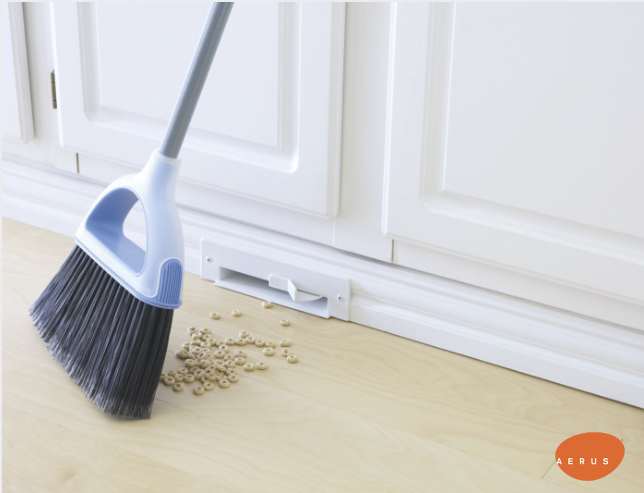 The CentraLux also has the super-handy option of a VacPan installation – an automatic dustpan that mounts flush against your wall or cabinet baseboard for the times when sweeping with a broom is necessary. To find out how you can purchase the Aerus CentraLux, visit our Store Locator page on our website. I really liked your tip on how a central vacuum system is really quiet. I’ve always been annoyed by how loud conventional vacuums are, this seems like a good alternative. My wife and I are building a new home and I’ve begun to work from home, maybe a central system would be better for us based on how quiet it is supposed to be. That’s one of the overwhelming positives we hear about when it comes to our CentraLux. Because the canister is located in the garage, attic or basement, all of the noise you usually associate with conventional vacuums is greatly reduced. I have only ever used a central vacuum once, but I do have to admit that what you say is true. It is easy to use, light, and very powerful. I kind of want one, especially if I can put in a dust pan vent. I don’t think it would make me enjoy vacuuming, but it would make it a little easier.